The Belgians might say the Tour of Flanders is the best race of the year. Italians could say Milan-Sanremo is the most beautiful. But the hardest race of the year? With labels like “hell”, “brutal”, “hardest of the hardest”, “queen of the classics”, Paris-Roubaix must be the toughest race of the year. There can be moments when Paris-Roubaix crosses from a race to a circus event thanks to the giant cobbles, the mud and more. But there is something beautiful in the contest and the way the race transforms the landscape that makes this a special race. It’s also high entertainment on TV. 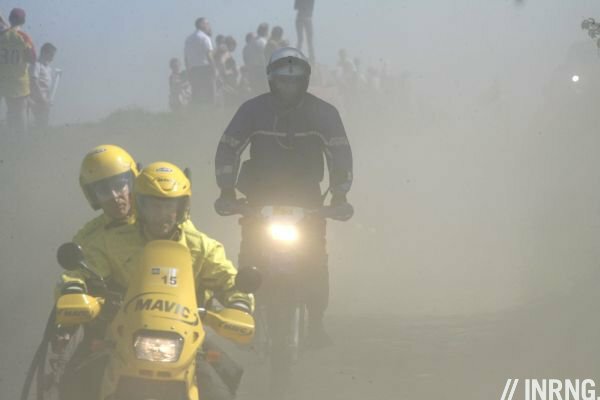 Today you can travel from Paris to Roubaix in about an hour with a high speed TGV train but the race deliberately seeks out the smallest and roughest roads possible, picking its way over ancient cobbles where only special vehicles can accompany the riders on the most irregular sections. It’s called Paris-Roubaix but it doesn’t start in Paris. Instead the start is in Compiègne, a fixture since 1968. The north of France is broadly flat but the first 100km include a few hills. Not that the climbers have a chance, more that if you ride or drive the course then you’ll notice the rollers. The race sticks to main roads until the first cobbles begin after 97.5km. They are graded by difficulty, the more “+” marks, the harder the section is. These sections total 51.5km and as you can see the difficulty varies. There’s no science , the rating comes from notes taken by race director Jean-François Pescheux and can vary from year to year. A farmer could cover the cobbles in mud, treacherous moss could take hold on another section and municipal authorities can repair the cobbles too. Like the Tour of Flanders, the strategic point is not just the cobbles alone but the approach. You want to go into a key section at the front because if a rider falls in front of you then at best you are delayed, at worst you go down too. Everyone knows this and the fight amongst riders and teams for a place near the front is fierce and tiring. “Luck, it doesn’t exist, you make it happen. If you fall, it’s because you made a mistake. If you puncture it’s because you rode where you shouldn’t have. Just look at the best, they hardly ever puncture“. Indeed when Theo De Rooy was asked if he’d ever return to the race he replied instantly: “Sure! It’s the most beautiful race in the world!“. The finish: held in the old velodrome, riders enter the concrete track and do half a lap in order to hear the bell ring hallelujah, signalling one final lap of the track. The banking can play a part, riders exploiting the slope to the line to launch their finishing sprint. Course summary: brutal cobbled sections can determine the race, these sections can be so awkward that small gaps between riders are amplified. The pavé multiply fatigue, cause crashes and provide high drama. But don’t forget the rest of the race, it is easy to think only of the cobbles but 200km are on ordinary roads. This will vary depending on the weather for the day but the cobbles are so extreme that they prise apart the riders. The path is so rough that even at max power you’re not going so fast, every cobble is trying to slow you. You can’t sit tight on the wheel of rider, partly because the reduced speed means there’s less benefit but also because you need to see where you’re going. The rider in front could switch direction, maybe because they’ve spotted a smoother path or worse, because they’re sliding involuntarily. There’s a choice. Ride the middle, the peak of the camber and experience the full boneshaking effect of the cobbles. Ride on the side of the road and you might get a smoother path as passing vehicles have smoothed the cobbles and mud and dust lie there. But that is where flint, glass and other puncture prone materials lie. This means that despite the flat profile of the race, it almost ends up as a collection of solo efforts. Be sure not to forget the 200km of tarmac and racing normality – and note several level crossings mean trains can hold up the race – but the cobbles do define the race. Ideally it means be strong and be at the front but the cobbles are far from ideal. Typically in the race an early breakaway will go. If there’s a tailwind – the forecast keeps changing – then teams might look to place stronger guys in the break. But with rain forecast and a head/crosswind too we should see a pure battle amongst the favourites. The early move will be contained, team leaders will send lieutenants to work to slim the group down and as if by magic each cobbled section will see the main bunch get thinner and thinner as fatigue and disaster take their toll. By the time we get to Mons-en-Pévèle or Cysoing it’s possible to have a select group of top contenders, usually with a few random names riding their good luck. The group should get thinner. I can’t recall a bunch sprint but from time to time a large group has arrived. If so, freshness counts more than sprinting ability so don’t be surprised to see the clever fox outpower the strong ox. But if the cobbles are damp then expect a small group or maybe a solo rider to enter the velodrome. The sections have ratings and things get evil from three stars upwards. These are not the cobbles of a driveway or urban street, they are rough stones ruined by passing tractors and often not even part of the tertiary road network in France. Actually you don’t need to ride the cobbles of Paris-Roubaix to experience just how nasty they can be. You can drive over the cobbles of the Tour of Flanders at a reasonable speed, the tyres and suspension in a fast rumble. For Roubaix the cars are banned from some cobbled sections and if you tried, you’d select first gear and try to pick a line across the pavé at 5km/h. In fact much of the race traffic is diverted from the worst of the cobbles. This is the only race of the year where team cars are modified to cope with the pavé… more on this in the tech section below. As for the riders the basic point is the rough surface. 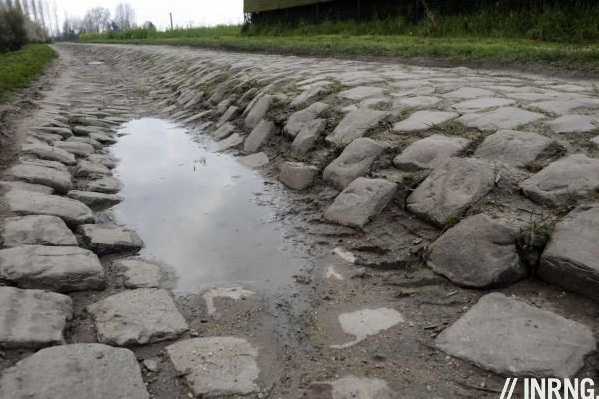 The bike and rider must roll over the cobbles and so you are constantly trying to go over rough obstacles.In the wet these ancient stones have been polished by horseshoes, cartwheels and others for hundreds of years and can be extra slippery. Riders often try to avoid the cobbles, preferring the sides but the mud and dirt here can contain hidden surprises as well as increasing the risk of a puncture. 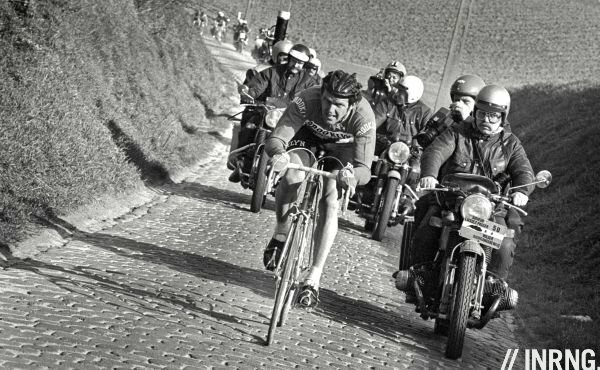 A total of 51,000 meters of pavé, with five or six stones every meter, is about 250,000-300,000 hammer blows on the legs of each rider. At 40 km/h, that’s an average of 10-12 blows per second, a constant vibration that leaves its mark on the entire body: neck, hands, arms, back and even the blood circulation get extremely stressed from the outside. Vibrations slow down the venous return from the legs (but also from the arms), hindering the delicate work of the valves that is necessary to defeat gravity’s pull. Ferrari has a point with the circulation, the veins have small one-way valves to help the blood flow but the shaking on the disrupts this and explains the additional fatigue experienced. If you’ve ever operated a pneumatic hammer you might know the feeling but the roads to Roubaix are relentless and random for a full working day. Many riders do enjoy the cobbles. FDJ’s Frédéric Guesdon says he dreams of the pavé in the same way a mountain climber longs for mountain passes. The bigger, heavier rides get their chance in a sport that normally values lightweight athletes. Still, often the best thing about the cobbles is leaving them, the moment you return to the tarmac is special feeling. The road feels like it is made from silk and velvet. Tom Boonen is the top favourite but think twice before you head for the bookmakers. First, there is the random element of the race. He could ride the perfect race only to puncture at the wrong moment and last year he was heading into the Arenberg Forest just right only to unship his chain. Second, he might have won last Sunday in Flanders but he was struggling on the Paterberg to match Filippo Pozzato, really grimacing. Then again, he is more suited to Paris-Roubaix as it is flatter and again he comes with a strong team at his service. Their work done last week helped set up his win, whether Terpstra or Chavanel. Pozzato is my second pick. The Italian is back in form and his mellifluous pedalling style is suited towards the cobbles. Mirroring last weekend’s race another obvious pick is Alessandro Ballan who again will look to avoid a sprint by forcing the power earlier. He also comes with growing team support with Greg Van Avermaet in better shape. Last year saw Johan Van Summeren win and who knows, he could go up the road and do it again, although team mate Sep Vanmarcke is a surer bet for Garmin-Barracuda. But this shows the importance of racing from the front, being ahead might mean burning up energy early but it buys certain advantages too. As such there are many riders who could surprise and the list of winners includes many riders who seized their chances on the day. Last week’s Tour of Flanders saw a large group finish behind so it’s hard to tell who was the strongest. Look out for Luca Paolini, Lars Boom, Edvald Boasson Hagen but there are many more. One in form rider is Sylvain Chavanel. He won the time trial in De Panne and is overdue a big result. He’s a rider who enjoys the rain and the forecast for Sunday says wet weather is due. Whilst expectation falls on Tom Boonen’s shoulders, don’t forget Chavanel is racing in front of a home crowd. You’ll find websites like cyclingnews.com offer full features and close-up pics but a quick word on the bikes used here. This race is so unlike others that different bikes can be used and there are all sorts of extra tricks and habits. The obvious one is wider section tyres, with riders swapping the usual 23mm width for 25mm or even 28mm. The larger contact offers increased grip but also rolls better over obstacles. In turn wide tyres mean frames with room and often some use special frames. Several manufacturers realise the publicity value of a bike that is “comfortable for Paris-Roubaix” but surely nothing is comfortable here. Riders add to the comfort by adding a second layer of bartape for more cushioning and some even tape their hands under the gloves. Others say they have to feel the cobbles and reject this. Some teams still use old wheels with heavy spokes proven to survive the course but increasingly composite technology means carbon rims can survive the race. 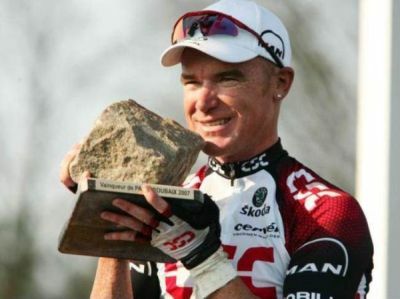 In 2007 Stuart O’Grady punctured in the Arenberg section and tool a spare wheel from the neutral service and rode this to the finish to take the win. The wheel in question was from 1986. It’s not just the bikes. Commissaires, neutral service, photographers and even the police outriders use off road motorbikes. Team cars in particular get special attention. The oil sump is usually the lowest part underneath the chassis and it can get a protection plate to prevent damage. Suspension is tweaked. Alloy rims are swapped for plain steel ones, even the tyres might be changed. And don’t forget the roof-racks where sometimes a toestrap or two comes in handy to keep valuable bikes even more secure. Indeed just as some new bikes get showcased, some teams will also use 4×4 or offroad versions from their vehicle sponsors for the day. Even then some of the cobbled sections are closed to team cars, both to protect the cobbles from heavy traffic but also to ensure the road is not blocked by broken vehicles. This is a race where the weather the day before matters as much on the day. Why? Because of the mud on the route. Rain showers were forecast for Saturday but it’s been quite dry. On the morning of the race this means any dampness won’t make for mud, rather it’ll just bind the dirt together to reduce the dust. The forecast keeps changing and the latest on Sunday is that there could be rain but late in the day. Whether it arrives on the course remains to be seen. Temperatures will reach no more than 9°C ( 50°F). There will also be a light breeze from the west, 10km/h from the south-west that rises to 20km/h in places towards the end of the race. It’ll be shown live on French TV and Eurosport from 1.00pm to 5.00pm Euro time and on several other European channels too. In the US it is on NBC Sports startling live at 9.00am Eastern Time. Other countries with live coverage include: Australia where it’ll be live on SBS, Sky in New Zealand, RDS for Canada, J-Sports in Japan and Supersport in Africa. There will be internet video feeds for viewers around the world, be sure to see cyclingfans.com and steephill.tv. 25 teams will ride. I’ve now uploaded a copy of the provisional startlist (I didn’t rotate the text 90 degrees). You will see 10 riders per team. The first eight are those who are planning to start, the other two are replacement riders named to cover injury and illness before Sunday. It’s worth mentioning the trophy as it’s a no-frills version, a simple cobblestone mounted on a stand. But this makes it more exclusive than any golden cup or silver shield and the trophy matches the hardman image of the race and the region. Cash: the winner collects €30,000 and the total prize fund of €91,000 with €500 for 20th place. The race was created in 1896 by a textiles industrialist Théodore Vienne to mark the opening of a new velodrome in Roubaix. In the early editions the 280km distance was hard enough, in those days roads were either dust tracks or cobbled and even the journey by steam train was a considerable voyage. Over the years the cobbles were gradually replaced with smoother asphalt. This presented the organisers with a problem, the race was becoming a long procession with a sprint finish. Come the 1960s and the race started to hunt for cobbles, fining fiendish farmtracks as a means of splitting the bunch. By 1968 the start was moved to Compiègne. Belgian Roger De Vlaeminck (pictured) holds the record with four wins in the race. Two riders can make history this Sunday. George Hincapie and Frédéric Guesdon have done this race 16 times each, equal to Servais Knaven and Raymond Impanis. If Hincapie and Guesdon finish, they will set a new record of 17 races. “It’s called Paris-Roubaix but it doesn’t start in Roubaix”. That should be Paris obviously. I was just about to make the same observation. Otherwise, excellent preview to a great race. I just skimmed through it (will come back later) but what a great review! This site has become a must visit on a daily basis for me. Interesting Ferrari observation, I thought I was slowing down with age, but now it seems it may be the crap road surfaces I am riding on. :). Nice read. Almost feels unworthy sitting at work reading this on a padded chair in a warm office. Great piece. Ferrari’s quote sums it up for me. Though ive never been to the Ronde, I love this race. I’ve placed myself on the Carrefour de l’Arbre the last two years and will be there on Sunday. It’s been fine both years, last year was HOT, and it’s like war with dust, helicopters, battered cars, bikes and bodies and the noise. My day will start at home at 3.30am and I’ll return at about 11pm. Every second worth it to watch riders passing for 30 minutes and be part of the drama. I feel I should underline that Hinault called the race a “connerie de course” right AFTER WINNING IT, which makes a big difference in my mind. Bundle: pure Hinault there. I think he rode it to prove he could win and never returned. Ole: thanks. The startsheet seems to be changing all the time, I’ll keep an eye on this. I love Hinault’s conviction and arrogance; he hated it but rode it to prove he didn’t fear it. And won it. Great piece! We’re on our way to the airport now and who knows. might run into some other Inner Ring fans there? Nice preview. Every race fan should try and get to see this race first hand, it will be an experience which will stay with you forever, fantastic! Is there a reason folks aren’t mentioning thor? Paul: it’s more that he’s not shown any form so far this year. He’s strong and well-suited to the race but still an outsider given the lack of results so far. Very comprehensive article, from prize money to contenders … Well done. Great article! But, if the cobblestones are to tough, why don’t their bikes take on more aspects of mountain bikes? Shocks? More drag, certainly, but less chance of a breakdown. In terms of potential history to be made this weekend, if Boonen wins it will be his 4th P-R, matching DeVlaeminck’s record number of victories. Also, for US & Canadian fans, cycling.tv is running the first hour of the race free Sunday starting at 7:00 Eastern time. The commentary is astute and insightful, quite a welcome change from the sophomoric bombast of Phil and Paul. Ken: it’s been done before. See http://www.cyclingnews.com/features/paris-roubaix-bikes-how-theyve-evolved but some riders just never got on with the suspension, even with a lock for the tarmac sections. Plus remember the teams are sponsored by bike manufacturers and if their bikes are marketed as good/strong/comfortable enough for Paris-Roubaix then this is great marketing with a message that there’s no need for many modifications, your bike can handle rough roads etc. It will be shown live in the US on nbc sports (used to be versus). They showed flanders live last weekend. It’s about time! keep in mind that on versus there is a commercial break every 5 minutes. better than nothing of course. but during the Ronde they missed many of the crucial moments of the race. My solution was to have versus on, then have my laptop on the sporza feed so that i can stay uptodate when versus goes to commercial. Second on Cycling.TV. I have been very satisfied with my subscription. If you miss the race due to Easter travel it will be there waiting for you when you get back as well as anything they covered this season. Awesome. Outstanding pre-race rundown INRNG. Thanks! I’m used to seeing pro bikes featured in tech sections, but I feel like I’m seeing an increasing number of riders doing videos for the online magazines talking about how great their bikes are and highlighting the features. The line between journalism and advertising feels increasingly blurry to me. Inrng, any thoughts on this? Some possible residual mud from Saturday’s rain (40% chance), which would give the most experienced riders an advantage. – Pippo!! Gotta be ahead of Boonen to win it, cuz Tommeke’s legs are on fire in sprints this year! – Sylvain Chavanel, as a solo breakaway and wins it for France! – Sep Vanmarcke — great team support, Garmin would love back-to-back wins. Here’s a thought: Paris – Roubaix is perhaps one of the best events when it comes to developing bikes that benefit the general race bike riding public! Sure, those über-aero Cervelo S5’s and almost super sonic Specialized Shiv TT-bikes are really neat and all, but when was the last time you spent the better part of your last ride averaging in excess of 40kph? Paris – Roubaix on the other hand is so extreme that equipment sponsors overdo each other developing a bike that allows a pro to ride in relative comfort in order to stay reasonably fresh come those 1.5 laps in the velodrome, the bike (and wheels too!) need to be tough as nails so those guys don’t have to stand on the side of the cobbled farm track like a bump on a log waiting for that yellow moto to come lend a spare wheel. If the race is muddy they’ll need mud clearance for those 27mm FMB tubulars – 27mm tires usually won’t fit in a regular frame. The roads I ride on is leaps and bounds less brutal than those cobbles, but I still have to negotiate cobbled stretches of down town roads; I will have to cross old, beat up tram tracks; I will ride secondary and tertiary roads that recently have been used to move muddy farm equipment; there’ll be huge cracks in the road from when the frost in the grounds thaw up.. If I could have a road bike that let me ride all this in relative comfort, not break down because it was designed around a 50kg mountain goat and allow my body to stay a bit fresher for playing with the kids later in the day – wouldn’t that be pretty neat? “Flecha could upstage Stannard, ya never know” mix-up in the order there? Like the new Favicon! Much cleaner and clearer than the old chainring one. Chapeau Tommeke! 50km solo breakaway and the chasers were never able to make even a dent in that time! So impressed with his raw power and endurance, sustained for so many kms. Whoa! Congrats Tom on making a big historical mark today — four wins on those cobbles and thirty-five years after de Vlaeminck won his last P-R! Great sprint between Turgot and Ballan, and always impressed with Flecha, who rode to fourth place not fully recovered from injury. ‘Course Flecha (and Hoogerland) both completed Stage 9 in the TDF after being hit by the French TV car — these guys are the toughest athletes on the planet. @daniel: I meant what I wrote only because Flecha wasn’t fully recovered and said he had no big aspirations for today, but I shoulda known that he’d finish Top 5 anyway. Stannard popped as it was. Also, hats off to Taylor Phinney on his 15th place finish. He’ll be on the podium sooner than later. Wished it had really rained to have added another variable to this year’s edition, but no doubt Tommeke is the man to beat in 2012.